Today, the National Organization of Gay and Lesbian Scientists and Technical Professionals (NOGLSTP) is proud to announce the winners for the 2015/2016 NOGLSTP Out To Innovate™ Scholarships, made possible by a 2014 Innovation Generation grant from the Motorola Solutions Foundation. The winner of the 2015/2016 Out to Innovate™ Undergraduate Scholarship is Rachel Owen. Rachel will be entering her final year at Western Washington University this fall and completing her coursework for a dual major in physics and mathematics with graduation planned for Spring 2016. During her time at WWU, Rachel has worked on various research projects including her senior thesis, Dual Random Quantum Walk Search Algorithms, with Dr. Brandon Peden for the Honors Department. In addition, she was granted a National Science Foundation REU at the Institute of Research in Electronics and Applied Physics at the University of Maryland – College Park, and was awarded overall best research project by IREAP for her work for Dr. John Rodgers in chaos and nonlinear dynamics. She had the opportunity to present this project at the 2015 meeting of the American Physical Society in San Antonio, TX and received an Undergraduate Research Presentation Award. 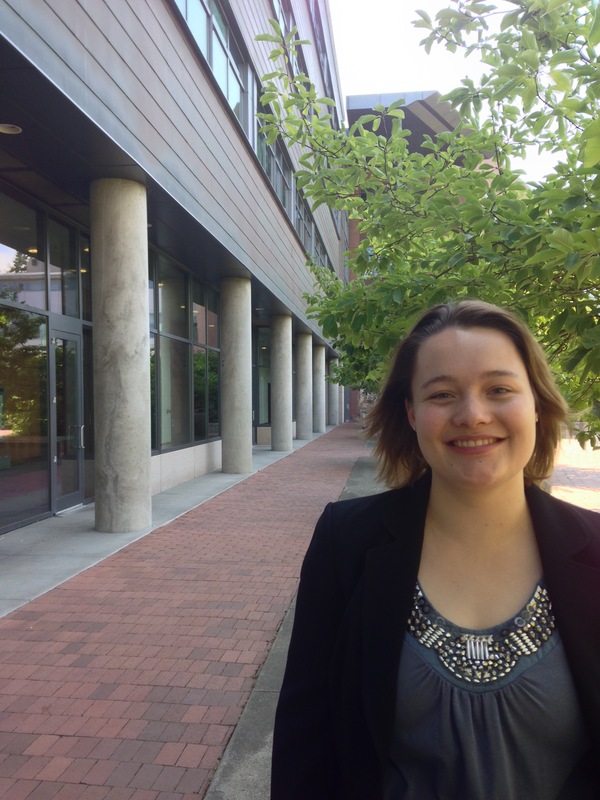 In addition to research, Rachel has enjoyed helping her peers as an undergraduate lab teaching assistant for the WWU Physics Department and as a Math Fellow tutor for the WWU Mathematics Department. Rachel comes from a small town in northern Idaho, and initially struggled with recognition of her sexual orientation. With the support of family and her community at Western Washington, she is now an actively out lesbian on her college campus and an advocate for the LGBTQ community. The support that she has received from her advisors and other members of the physics community has inspired her to work to address social issues in STEM fields as a career goal, along with research and teaching. She has been elected president of WWU Women in Physics for 2015/2016 and is a founder of the first LGBTQ STEM club at Western, Out in Science. Through involvement in both of these organizations she hopes to promote solidarity and diversity amongst the physics majors, as well as provide a support system for members of the LGBTQ community in STEM fields at Western. She is currently working as a research assistant for Dr. Janelle Leger in experimental photonics at WWU and plans to pursue her doctorate in physics after her undergraduate career. The winner of the 2015/2016 Out to Innovate™ Graduate Scholarship is Dustin Plowman. Mr. Plowman is currently a student at the University Of California Riverside School Of Medicine. Mr. Plowman previously received a Masters of Arts in Urban Education from Loyola Marymount University and a Bachelors degree from University of Pittsburgh in. He is the first of his family to have a college degree. On his own since he was 18, he has boot-strapped himself through his journey working half-time to making ends meet. He taught science in the Teach for America Program for four years. Mr. Plowman has always been very active in the LGBTQ community, founding the LGBTQ LA Focus Group for Teach for America, and is the founding chair of Gender & Sexuality Action Committee affiliated with the Division of American Medical Student Association at the UCR School of Medicine. One of his goals is to establish an outreach program between the UCR School of Medicine and the LGBTQ+ community within the Inland Empire. As a physician he would like to serve the transgender, gay, and impoverished populations and advocate for equitable healthcare. These scholarships are intended for undergraduate and graduate students pursuing degrees in science, technology, engineering or mathematics (STEM) programs who are either lesbian, gay, bisexual, transgender (LGBTQ+) or an active ally of the LGBTQ+ community. The scholarships are designed to promote academic excellence and increased visibility of talented LGBTQ+ students in STEM careers. Funded at $5,000 each, the scholarships are awarded in the Fall of the 2015/2016 Academic Year. As the embodiment of pride in LGBTQ+ and STEM communities, all scholarship applicants will receive a complimentary student membership in NOGLSTP. The scholarship winners will attend the next Out to Innovate™ Summit, a two day summit for LGBT students, faculty and professionals in science, technology, engineering and mathematics (date and location to be determined). The program is marking its fifth year as a source of educational support. For more information about NOGLSTP’s Out to Innovate™ Scholarship Program, contact the scholarship coordinator at scholarships at noglstp dot org. For more information about NOGLSTP, contact Rochelle Diamond, NOGLSTP chair and Caltech research biologist, 626-484-7022; chair at NOGLSTP dot org. NOGLSTP was established in 1980, incorporated in the state of California in 1991, and was granted IRS 501 (c) 3 nonprofit status in 1992. NOGLSTP is a professional society that educates and advocates for LGBTQ people in STEM. NOGLSTP presents educational symposia and workshops nationwide and fosters dialog with other professional societies, academia, and industry to facilitate diversity and inclusion in the workplace. NOGLSTP is an affiliate of the American Association for the Advancement of Science, is a participating professional society member of MentorNet®, a sustaining member of the National Postdoctoral Association, a member of the Gay and Lesbian Leadership Institute Presidential Advisory Project’s Coalition, a partner with the Higher Education Recruitment Consortium, a founding member of the E-Week (now DiscoverE) Diversity Council, and an American Chemical Society Diversity Partner. For more information, visit the website at www.noglstp.org or contact scholarships at noglstp dot org.